The Art of Living Foundation in Bangalore is the headquarters of the Art of Living Foundation, a heavenly abode to all the visitors who wish to rejuvenate from their stress. Situated in Bangalore, Karnataka, it's official name is 'Ved Vignan Mahavidya Peeth Bangalore International Center'. 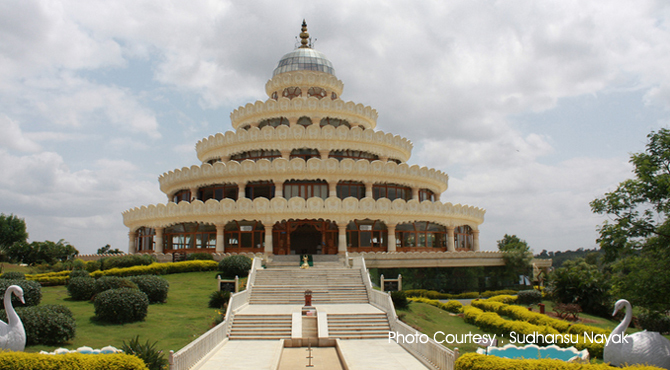 The Ashram was founded by the world-renowned spiritual leader and founder of the Art of Living, Sri Sri Ravi Shankar. Born in Tamil Nadu, millions of people world over are being touched by his childlike simplicity and joy. He started showing his spiritual inclination early in life. Recognizing his profoundly spiritual nature, Sri Sri's parents ensured that his education would encompass both spiritual and worldly knowledge. He completed his degree in science and Vedic literature (Hindu scriptures) by the age of 17. In 1982, he started the Art of Living Foundation, a United Nations NGO. He introduced to the world 'Sudarshan (right vision) Kriya (purifying action) technique' —a unique breathing process, which removes stress and negative toxins from the body by rejuvenating each and every cell. The Foundation aims at fostering health at every conceivable human level-mental, physical, emotional as well as spiritual. Situated on a small hill, this ashram draws people from all over India-most of them young, modern, middle- class professionals as well as an increasing number of foreign visitors. Spanning over a large area the ashram complex area including offices, restaurant, dining hall, quarters, library, prayer hall, lawns and a lotus-shaped tower. Apart from these, the ashram complex also houses a school, which has 700 children from the nearby villages. With hundreds of teachers and centers in over fifty countries, Sri Sri Ravi Shankar's Art of living course poised to become the Transcendental Meditation of the next generation. The Art of Living neatly repackages, traditional yogic techniques and Vedic philosophy into a simple, nonsectarian system that appeals to mainstreamers who might be uncomfortable in a traditional ashram. Inside the vast ashram complex, one can see pleasant faces with smiles wishing 'Jai Gurudev'. There is a beautiful lotus shaped building 'Vishalakshi Mantap' inside the Ashram and in front of this building, are teak trees where one can relax. Near to this, is the meditation place where people can sit for meditation. One can see Guruji's photo inside the hall. The exit side of ashram can see elephants playing with sugar cane sticks. The Ashram schedule begins with singing Jai Gurudev hymns and Vedic Chants. When the echo of this music reaches its climax, the devotees begin to rock, raised their hands and gently swaying to the hymn. A personality with extolling the virtues of love and brotherhood and then extends his arms for everyone to come forth and embrace him. But it is difficult to find him at this ashram always, since he is often on tour worldwide courses which are led by his trained teachers. So if one wants his schedule, contact the Bangalore city centre or the office in Santa Barbara California. If he in Ashram and one wish to get a darshan of Guruji, one can participate in evening Satsangs between 7.30 PM and 9 PM on weekdays or at 4.30 PM on Sundays. To stay at this ashram, one must be participate in one of the Art of Living course - either the introductory weekend or one of the four to ten days advanced courses. The Art of Living has a minimal organizational structure and a strong orientation toward service projects. The Ashram conducts a number of programmes for community including free primary education for rural children, vocational training for women, environmental protection projects and nutritional and medical programs. The Ashram can accommodate about four hundred people in shared rooms with attached baths and ten bed dormitories. Vegetarian food is served. The ashram has a banana plantation, vegetable gardens and a late. Their milk is produced by their own cows, the cow dung is used for bio gas plant that provides energy for the kitchen. A large meditation hall seats about one thousand people; a smaller hall is for ceremonies, meditation and smaller programmes. Volleyball courts are available. Construction is underway for numerous other facilities, adding to the air of growth and dynamism. Other facilities include an ayurvedic clinic and vedic school. A typical introductory course begins with a puja at 5.30am, followed by hatha yoga asanas., pranayama, sudarshan kriya, and meditation. There are several hours of instruction and practice in the morning and afternoon, followed by a nature walk. In the evening is satsang with the teacher. The advanced course is largely conducted in silence. Special pujas are celebrated on Monday mornings. In India for the introductory course (two evenings and one day) is Rs 500. For this one can arrive on Thursday and register. The course starts at Friday 6 am to 6 pm on Sunday. Fee : Indians Rs : 2000 (includes food, accommodation). Foreigners : $150 for the same. The advanced course (five to ten days ). When staying at the ashram, donations are accepted to cover meals and accommodations. advance registration is essential.